I have had sensitive teeth for as long as I can remember. My usual way of coping involves avoiding the foods that trigger the most painful attacks. Ice cream is one of the worst offenders and is a food I avoid rather than deal with the pain. When temptation runs really high, I let the ice cream melt and then eat it. I know it's not really ice cream at that point, but hey, a girl's gotta get her rocky road fix once in a while. I also drink room temperature water to avoid the instant pain of cold liquid hitting my sensitive teeth. Another pain trigger is cold weather, which means I get a little wimpy this time of year. Bundling a scarf up to my eyes helps keep the cold air out of my mouth while I'm outside, but never really deals with the issue of having sensitive teeth. When trying the product rub the toothpaste directly on the sensitive tooth with your fingertip and gently massage for one minute. I've been using Colgate Sensitive Pro-Relief for four days and have noticed a difference since the second day. My tolerance to cold drinks has increased and I did not get the instant stabbing pain usually associated with cold water from my super cold fridge. With continued use I hope to combat the sensitivity experienced when outside in cold weather. 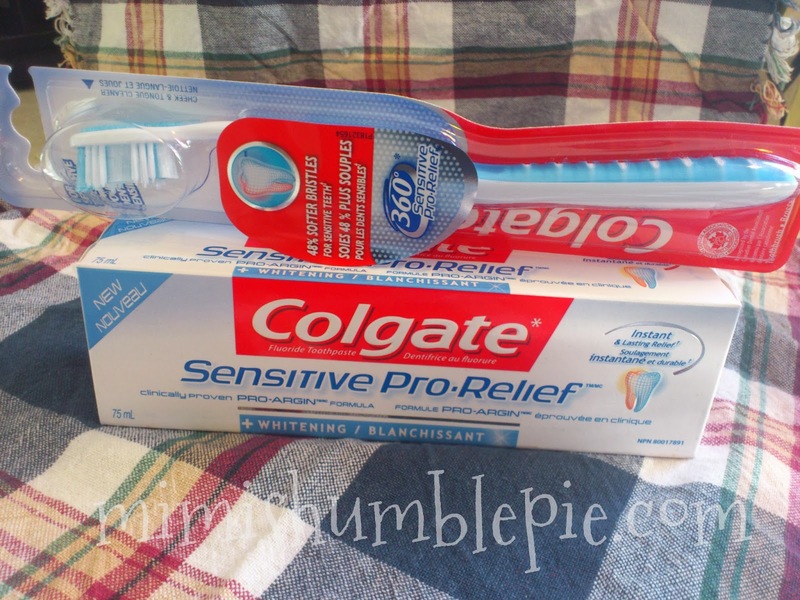 I invite you to try the Colgate Sensitive Pro-Relief Challenge. Sensitive teeth sufferers can sign up for a free sample of Colgate Sensitive Pro-Relief (only 1 sample per house hold). Take the Colgate Sensitive Pro-Relief Challenge today before samples disappear. Sample includes one (1) trial size tube (22 mL) of Colgate Sensitive Pro-Relief toothpaste and a coupon for $1 off your purchase of Colgate Sensitive Pro-Relief toothpaste.